To sound a horn or buzzer tone as required by several events, the Polaris timer console provides a direct audio connection into your PA system (sound system) so that the horn tone will sound over the speakers in your arena. However, if you cannot connect to a sound system, the external horn can be used to generate a loud horn tone without a sound system. For events like bull riding, cutting and team penning, the timer automatically sounds the horn at the appropriate time limit(s). When used for Roping, the horn automatically sounds to indicate a broken barrier. When used with header and heeler barriers, the horn sounds a different pattern for the header than for the heeler. The horn can be manually sounded by simply pressing a button. The external horn is small and compact (about 5 inches square and 3 inches deep). 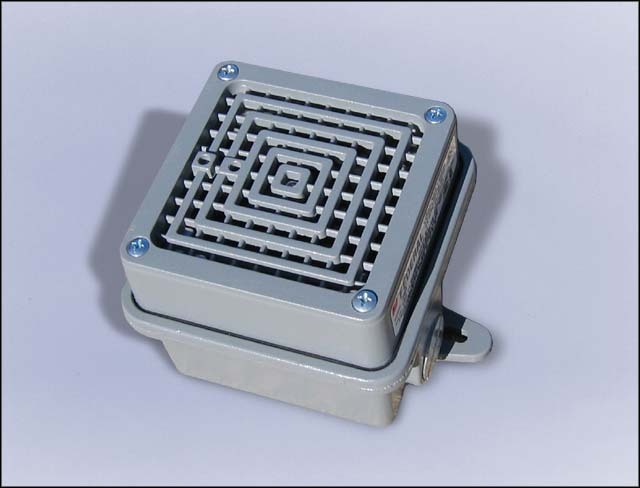 The external horn emits a very loud buzzer sound – not a "car alarm" siren. The external horn includes an 8 foot A/C power cord and a 25 foot data cord which runs back to the timer console in the announcer's booth. The external horn is required only if you are not able to connect to your PA system (sound system) with one of our horn audio cables (see below). If you are not able to connect to a sound system for sounding the horn or other tones, the external horn can be connected to your timer instead. The horn is very loud and requires no additional amplification. The line level horn cable plugs into an RCA phono-jack on your PA system ("Aux", "CD In", "Tape In", "Left", "Right", etc.). Note: This cable is typically included with most timing system. You may not need to order it here. The microphone level cable plugs into a 1/4" high-impedance microphone jack which is present on most PA systems.